Universal Orlando released a new micro-site for the Wizarding World of Harry Potter park, today! The site allows you to explore the new Harry Potter park at Islands of Adventure, including some new views of the rides! A lot of the site is merely a compilation of all the pictures, videos, and ads that Universal has released for the Wizarding World of Harry Potter park. 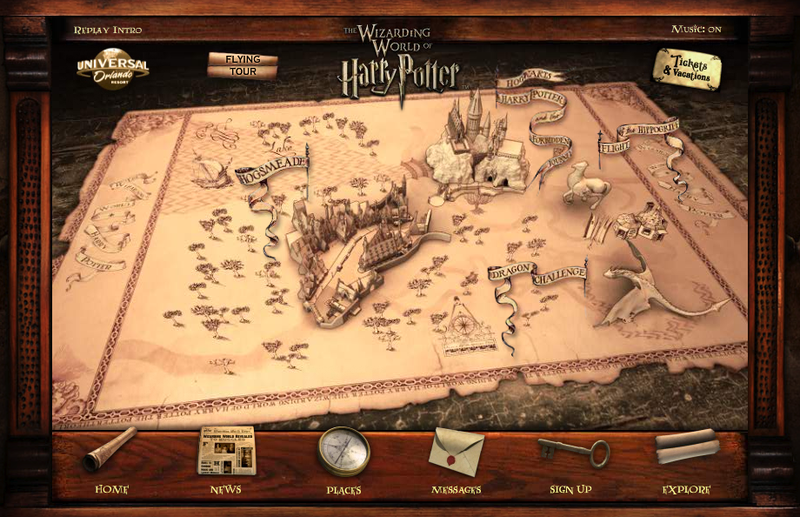 However, you can sign-up for updates, send messages using the Owl Post, get a fly over tour of the new Harry Potter theme park, see the latest copy of the Wizarding World News newspaper, and see places throughout Hogsmeade. The “places” option shows you computer generated images and background stories for Harry Potter and the Forbidden Journey, Dragon’s Challenge, Flight of the Hippogriff, Three Broomsticks, Dervish & Banges, Ollivanders, Honeydukes, Filches Emporium of Confiscated Goods, Zonko’s, and the Owl Post. I signed up for their email list, as this will likely be one of the first places to hear about the Harry Potter park opening date.